There are as many reasons to choose a Reeves Motodrive as there are Motodrive features. Along with its traditional proven design, the Reeves Motodrive offers the materials, design and rigid construction demanded by today’s needs. 1 – The Motodrive handwheel has built-in ‘Posi-stop’ location which prevents drift from the set speed. The handwheel can be repositioned simply, by rotating the control cover in most models. 2 – Calibrated spring pressure ensures correct belt tension at all speeds. Motodrives above 1.5kW rating have a self-contained spring assembly which prevents spring ‘escape’ during disassembly. 3 – Sure-gripping variable speed belt is quickly and easily replaced by removing 8 bolts. Built-in pulley alignment provides ease of service, even in the field. 4 – Patented ‘close grooving’ lubrication distributes lubricant smoothly and evenly over all sliding contact areas. This prevents any metal-to-metal contact and virtually eliminates fretting corrosion. Excess grease escapes from the back of the pulley. 5 – One piece cast-iron belt case provides maximum strength and rigidity and provides lasting alignment of all internal components. 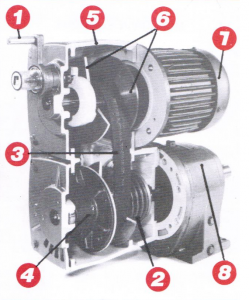 6 – Constant speed variable pitch pulley is located next to the motor bearing for minimum overhung load. 7 – Stock-standard metric motors with IEC flange sizes, facilitating replacement in the field. 8 – Heavy duty gearboxes are designed to meet AGMA requirements. All Reeves Motodrives are suitable for bidirectional rotation with full output power being delivered in either direction. The Reeves Motodrive has undergone thirty years of development and improvement with no change to its basic dependable principle.